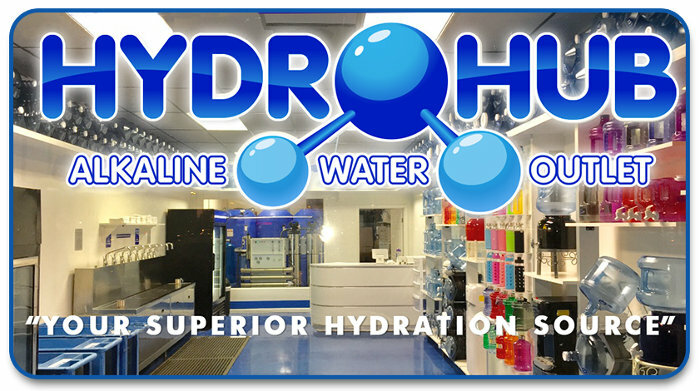 Enjoy Hydrohub’s premium line of drinking water products! Designed to integrate a superior level of hydration into your body and daily lifestyle. Visit our Tucson location for convenient climate-controlled water vending, 24/7! Conveniently located by Fry’s at Ina and Thornydale. Enjoy The Benefits of Premium Drinking Water at Hydrohub in Tucson. Hydrohub’s Mineral Alkaline Drinking Water is designed to achieve greater body absorption and recovery times while promoting enhanced consumption and hydration. Extensive research and use indicates many health and additional benefits experienced through the consumption of premium, mineral Alkaline water. Now you too can experience the benefts for yourself. Climate controlled vending units offer Alkaline and Non-Alkaline drinking water 24/7 and accept all major forms of payment. Are you commuting? Hydrohub mineral alkaline water retains valuable nutrients and an optimal 9+pH for several months. Stop in occasionally and stock up. Filtration, U.V. sterilization and additive equipment are regularly maintained and climate control processed to produce increased drinking water quality, taste and benefit. Included are the removal of chlorine, chloramine, insecticides, gases, solvents, lead, chemical, viral, and other harmful biological contaminants. How beneficial is your current drinking water source? Hydrohub offers quality savings, delivering the benefits of a high-end Alkaline water product at just a fraction of the cost of alternative sources. Hydrohub offers a wide range of BPA free and environmentally safe refillable bottling products to assist your efforts towards waste reduction. Stop in during normal business hours and we will be happy to assist you in our store with ozone rinsing, fills and loads. Clean water should come from a clean interior source. Hydrohub invites you to experience its fresh, upscale outlet located conveniently by Fry’s Grocers at Ina and Thornydale. What can Mineral Alkaline Water do for you? Above are just some of the noted benefits associated with maintaining a bodily environment that is both Alkaline and nutrient rich. Visit our Tucson water station today and start to feel the health benefits for yourself. Many human ailments can be directly linked to a lack of hydration. This makes a lot of sense considering that the body is made up of over 60% water. According to the Journal of Biological Chemistry, the brain and heart are comprised of 73% water, the lungs 83%, the skin 64%, muscles and kidneys are 79% and even our bones are comprised of a surprising 31% water. Therefore, the Institute of Medicine recommends that an adult male consume a minimum of about 3.7 liters of water per day (15 cups) and an adult female about 2.7 liters per day (11 cups). Your health is highly dependent on water as every cell, tissue and organ in your body need an adequate supply to function properly. Water is required to achieve overall good health as well as maintaining proper body temperature, removing waste and lubricating tissue and joints. Are you dehydrated? Most people are. Over 70% of the U.S. population is considered to be chronically dehydrated while 98% of all humans fail to consume the volume of water that their bodies require. To make matters worse, most are drinking the wrong kind of water – water which is unclean, nutrient depleted or both. So what makes Hydrohub’s water different? We use an 11-step process to bring you premium, nutrient rich alkaline water that provides superior hydration and absorption. Learn more about our premium drinking water here and stop by our Tucson location to try some today. Located by Fry’s at Ina and Thornydale.